Ongoing IDF, Shin Bet investigation reveals at least 2 dozen terrorists among rioters killed in yesterday's riots. The IDF and the Shin Bet have identified 24 terrorists so far among the rioters who were killed along the Gaza border Monday. The majority of the fatalities belonged to the Hamas terrorist organization, while others belonged to Islamic Jihad. 58 people were killed when the demonstrations along the Gaza border turned violent Monday. So far, Hamas has acknowledged that ten of the dead were members of its organization, and Islamic Jihad has acknowledged that three of the deceased were members of its organization. 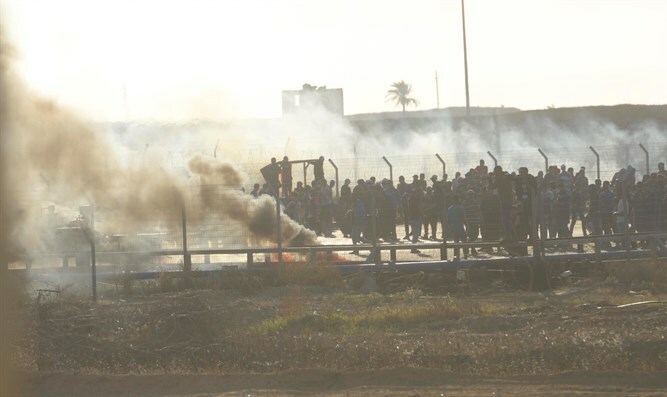 Approximately 400 demonstrators are currently gathered at several locations along the Gaza perimeter fence. No serious incidents have occurred yet today, the IDF stated. Violent disturbances are also taking place in 18 locations in Judea and Samaria, where 1,300 violent rioters gathered. The rioters threw stones, Molotov Cocktails and burning tires at the security forces. The IDF responded with riot dispersal measures.